That explained the small crowd; everybody was at the ICOM gig there! I originally went hoping to WAZZAAAP people there. I did bump into celebrities, yes, but minor ones at that. When I did see four chicks walking past, I wondered if they used RentACrowd as featured in their magazine. Then again, if you can get minor celebrities to come on their own money, why not? 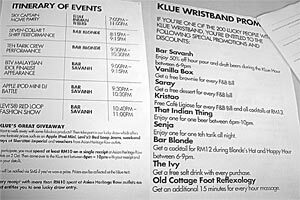 I hung out at Subang. Is there much to say about a Monday? 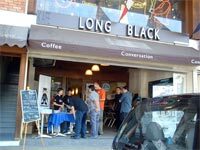 I headed to Long Black Cafe (under Mahogany, SS2) for Camp EA 2004. I pre-registered online, but I didn’t expect a sticker saying “Albert Ng, Astro/Xfresh”, with press kits and all. I thought I was going as a nosy gamer, not a journalist. 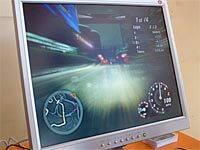 They showcased final builds of FIFA 2005, Armies Of Exigo and personally-anticipated Need For Speed: Underground 2. 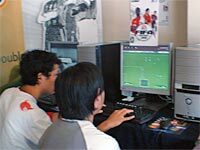 The Malaysian FIFA champions for World Cybergames 2003 and 2004 duke it out in FIFA 2005. 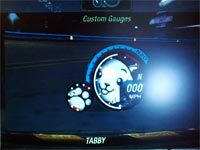 You could customize more things, like the color of your speedometer dial, the color of the dots, and even the inlay of the gauge! Oh, and it rains sometimes. The rain dropping on the window made a cool warping effect, refracting the surroundings realistically. 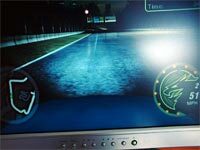 It took quite a while to find the eagerly awaited Free Run mode – you could just drive around the streets leisurely. If you saw another car, you could engage in a race by kissing its bumper. Then, he’d try to outrun you. The path for this impromptu race would not be set; the objective was to get as far and out of your sight. The car in the lead would get to choose the route. 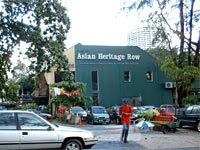 After work, I headed to Bangkok Bank to get my bus home; however, the bus was half-hour late, and took another half-hour to crawl to Sultan Ismail. Traffic was unusually bad that day, and so I got off the bus and took the STAR LRT to PWTC, where I took a cab home. Alas, he too was not spared from the day’s particularly massive traffic. He then relayed stories of the pitiful life of a taxi driver. Once, he was a minibus driver (those death-trap kings of the road!) He then became a PUTRA feeder bus driver at Taman Jaya. There, it was the life – medical benefits, a booth to hang out and read newspapers at, a decent pay (what a fresh degree holder would get! 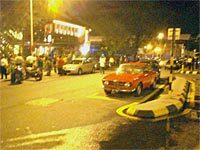 ), being able to take leave, doing the relatively jam-free Taman Jaya area; he got bored after a couple of years and moved to a much more challenging job – Klang Valley cabbie. Once he paid off the cab, he’d go back to being a bus driver though. Oh hey since you probably noticed the unexcited, lethargic delivery of the previous days, there is an explanation. As far as I remembered, I did everything, and even took out the paper where I copied the questions to. Apparently what she copied was just Part 2 as she needed to explain them; all the assignment questions were online. Dammit, she could’ve told me earlier that I failed. Okay so it was my fault for not checking, but couldn’t she give me a chance? She knew that if I knew there was a Part 1, I would do it well and pass. About a month after the exam, I checked my results online; I found out that my login didn’t work anymore, so I went to college to ask them to reset my password. I wrote my email address, student ID, and phone number on a piece of paper, and they said they’d take care of it. I tried again at the office, and it still didn’t work; so, I headed to college to ask again. I gave them my student ID, and they went, “oh we sent you an email already what!” They even printed it out, with my new password. Problem was, the email was addressed to albnole@hotmail.com. Okay I shall remember to write my K’s properly. Frustrated, I went to a cybercafe in Ampang Park to check my results with my new password. Fail/Refer, it said. Take the exam again, it meant. After all that misfortune, this was something I could laugh at. Since I was on a roll of bad luck, I decided to take a cab and not risk waiting for/in an Intrakota. All was fine till I found out I had no money! Out came ancient 1 Ringgit notes from the secret reserves. 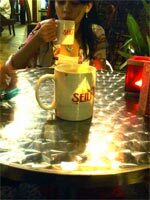 This entry was posted in General, Music, Pictures, Travelling on October 7, 2004 by 2konbla. Hahahaha, what the hell were you doing on the escalator? albert u donkey! u woke me up just to tell me about u failing ur exam. I WAS SLEEPING SO NICELY! and after that i couldnt go back to sleep anymore. siggghh. lol. Haha. What the heck were you hooligasn doing sitting on the escalator at subang square? 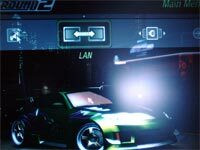 And yes, i can’t wait to put my hands on Needforspeed 2! The first game was rathe rfustrating but fun , nontheless. Eh, how come i never spot you guys at club7?Maybe becuz’ i go there in the mornings.